Paradise Tango offers weekly group tango classes for a range of experience levels. We also offer fitness classes as well. 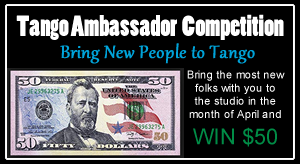 Go to our Group Classes link (above) or click "Read more" below to find out more information! Click on the Calendar image above to link to our PDF Calendar. For past and future calendars (when available) click on the "Calendar (All)" link above in the menu. 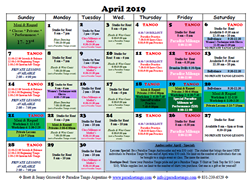 Our Calendar includes all Paradise Tango events, important community events, and non-Paradise Tango classes held at the studio (e.g. Blues, Belly dance, Hustle). Visitors to our website are shown by the dots on the map. Your current location and any other locations that are accessing the site will blink. As you can see Paradise Tango has been viewed by folks all over the world! Brett and Jenny Griswold have been dancing and teaching Argentine Tango together for 12 years. They specialize in teaching absolute beginners who are new to Tango and dancing in general and strive to make Tango accessible and welcoming to everyone. Over December 6-8, 2014 Brett and Jenny broke the Guinness World Record for "Longest Dance Marathon by a Couple" by dancing for 38 hours and 30 minutes. You can click on the image to be brought to the Official Guinness Page. On December 14, 2014 Brett and Jenny were the first couple to ever dance Argentine Tango for the full length of the Honolulu Marathon. They danced in an embrace the entire 26.2 miles and finished in 11 hours, 43 minutes and 8 seconds. They have submitted their accomplishment to Record Setter and are awaiting confirmation of their Record.